Silver Oak - Aged to perfection. 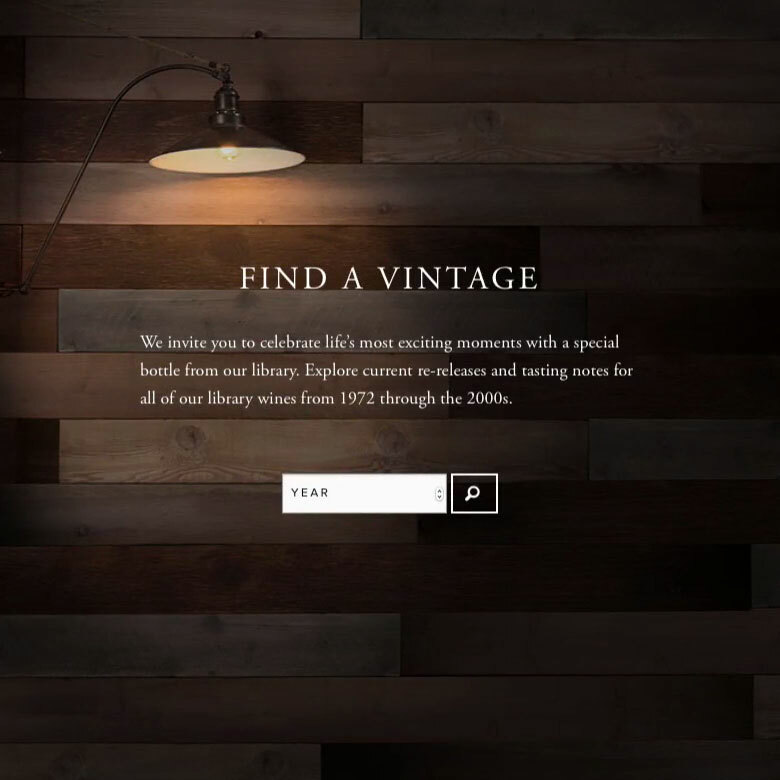 We partnered with the marketing team at Silver Oak to create a feature-rich, mobile responsive microsite to promote their exclusive library collection. Since the 1970’s, Silver Oak has put small quantities of each vintage into their library for later release so their customers can enjoy wines that have been cellared and aged to perfection. With a collaborative approach, we launched the collection by leading the content strategy and visual design, delivering a premium user experience that utilizes cutting edge technology. It was essential that the microsite shared Silver Oak’s rich history, while also telling the story behind their library program and how their collection of beautiful wines transform with age and time. We also needed to give the collection a luxury appeal. To accomplish this, we emphasized prominent typography, dark colors, and careful use of negative space. The result was a clean design that highlighted the exclusiveness of the collection. We designed an interactive search feature where visitors can browse over 30 years of vintage wines, identify tasting notes, and research the heritage behind the collection. In our approach, we utilized a responsive framework and integrated it into Silver Oak's ASP.NET website. We developed the microsite with technical SEO in mind and also showcased the latest in HTML5 and SASS technology. By developing a comprehensive and integrated approach, we were able to highlight Silver Oak’s rich tradition, history, and philosophy. When designing the microsite, we took a mobile-first approach to ensure a seamless user experience across any device. We showcased social media on the microsite to encourage users to share their Silver Oak moments on social. From the message to the visual design, we created a customer journey that was inspired by Silver Oak’s deep-rooted philosophy of making wines that are a pleasure to drink upon release and that also age gracefully for many years to come.